I've been working hard to make this even healthier and better tasting, so see the changes below. It is a wonderful dairy free banana bread, which takes on a fantastic caramel undertone when it cooks. 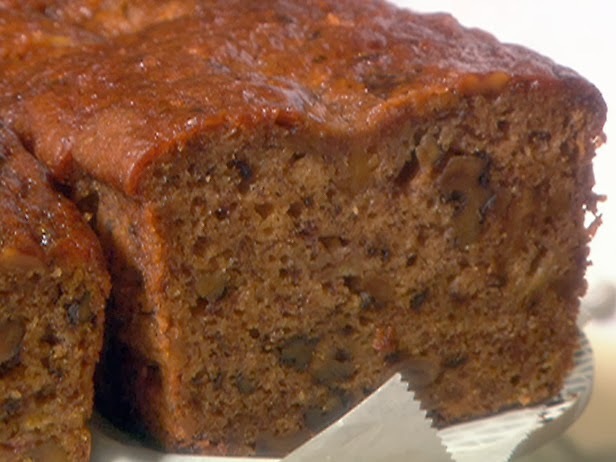 It is a quite dark and heavy banana bread, and packed with flavor. Preheat your oven to 350 degrees. Sift together the flour, salt, sugar, baking powder and spices. In a small cup, mix the soy milk and cider vinegar and allow it to sit for 2 minutes. Mix the soy milk mixture into the mashed bananas, vegetable oil, maple syrup, bourbon and vanilla extract and mix until just combined. Then fold in the dry ingredients bit by bit, just until incorporated. Do not over mix and then gently fold in the nuts and pour into a lightly greased loaf pan. Bake for 1 to 1 1/4 hours, until a knife inserted comes out relatively clean. It needs to cook for a while to develop the caramel undertone. Then allow to sit for at least 20 minutes, turn out of the loaf pan and serve. * I always take bananas that have gone a bit too ripe and put them in a plastic storage bag and freeze them for later use. They will keep indefinitely, and they really do make stunning banana bread. If you decide to use frozen bananas, you will need to make sure they come up to room temperature before mixing with other ingredients, otherwise the bread won't cook through.